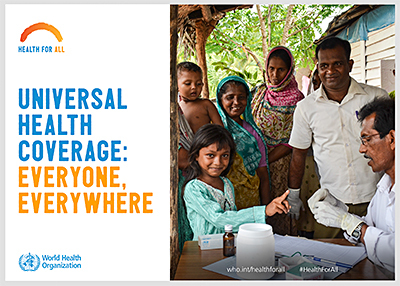 World Health Day 2018 – Universal Health Coverage: Everyone, Everywhere « Tech bytes for tea? Today is World Health Day. It falls on 7 April every year – the purpose is to draw worldwide attention to a subject of major importance to global health each year. In 2018, it is one of 9 official campaigns marked by the World Health Organization (WHO). * This article first appeared in HalenessMe2018.wordpress.com. At least half of the world’s people is currently unable to obtain essential health services. Almost 100 million people are being pushed into extreme poverty, forced to survive on just US$1.90 or less a day, because they have to pay for health services out of their own pockets. “Health for All” has been the WHO’s guiding vision for seven decades, since the Organization’s Constitution came into force on 7 April 1948. In this 70th anniversary year, WHO is calling on world leaders to live up to the pledges they made when they agreed in 2015 on the UN’s “Sustainable Development Goals”, and commit to concrete steps to achieve universal health coverage (UHC) by 2030. The United Nations Sustainable Development Goals (SDGs) are 17 goals with 169 targets that all 191 UN Member States have agreed to try to achieve by the ear 2030. Health has a central place in SDG 4: Ensure healthy lives and promoting well-being for all at all ages, underpinned by 13 targets that cover a wide spectrum of WHO’s work. Almost all of the other 16 goals are directly related to health or will contribute to health indirectly. This means ensuring that everyone, everywhere receives the health services needed without facing financial hardship. I personally believe that health is a human right – no one should have to choose between good health and death, or other life necessities. WHO’s lofty goal of universal health coverage will enable everyone to access the services that address the most important causes of disease and death and ensures that the quality of those services is good enough to improve the health of the people who receive them. Universal health coverage does not mean free coverage for all possible health interventions, regardless of the cost, as no country can provide all services free of charge on a sustainable basis. What can be a useful means of realising universal health coverage is the harnessing of technology to provide healthcare to those that need it – be it impoverished or inaccessible locales or modern, urbanised cities. Today’s article is based on an article that Dr Siaw Tung Yeng published on LinkedIn. Dr Siaw is the founder/CEO of Mobile Health, the company that developed the MaNaDr healthcare app which provides affordable and accessible healthcare to all by connecting patients, families, and friends, to a trusted network of doctors and other healthcare providers. One of these tools is telehealth. To me, telehealth is the systematic provision of healthcare services over physically separate environments by leveraging Information and Communications Technology (ICT). It also includes the exchanging of information for clinical purposes between providers and patients/caregivers over the telephone, through text messaging (SMS) or other similar applications (e.g. MaNaDr, iMessage, WhatsApp). In places where the patients are located in remote or inaccessible places, telemedicine is a viable way of reaching out to them to ensure they get the medical attention they deserve. In modern, urbanised cities such as Singapore, mobile healthcare apps like MaNaDr brings quality healthcare with greater convenience to the busy city dweller, greatly reducing the need and time wasted in physically visiting clinics and queuing to see the doctor. Most importantly, it connects every individual patient to his/her preferred and trusted doctor, and enables him/her to consult the trusted doctor anytime, anywhere, via the smartphone through text or video consultations. Here’s wishing that WHO achieves its goal of universal health coverage for everyone, everywhere by 2030. This entry was posted on Saturday, April 7th, 2018 at 7:12 am and is filed under Healthcare, hnm, Lifestyle, Sources, Wiki. You can follow any responses to this entry through the RSS 2.0 feed. You can leave a response, or trackback from your own site.